Guides Universities Courses Reviews Chats Articles HomeArticlesWho studies in Canada? Compared to local students, international students comprise 6.5% of the student population in post-secondary education. Generally these students come from 173 countries around the globe. As the increase of international students over the past decade shows the Canadian government is quite willing to provide visas for international students. The chart illustrates the countries of origin. The top position is China providing 30% international students. It is even more interesting to mention that since 2001 the number of Chinese students in Canada increased by an astonishing 296% soaring from 20.371 up to 80.627 students. Of course, to a certain extent it can be stated that China’s economic development is reflected here. 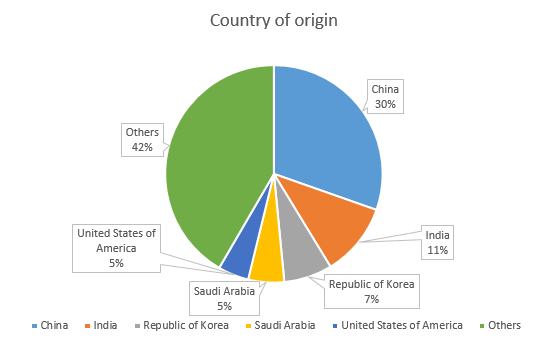 The second major country where students come from is India with 11% or 28.926 students, followed by the Republic of Korea with 7% - or 19.067 - of the international students. All in all Asian countries including contribute to approximately more than 50% of the international students because countries like Pakistan, Taiwan, Japan and many others are categorized as ‘Others’. Most favoured provinces favoured by international students are Ontarion, British Columbia, Quebec and Alberta. A detailed overview is given below, illustrating the exact amount of international students in each state in 2012.